This was for sure a big year for A. Lange & Söhne at the SIHH 2016 Salon International de la Haute Horlogerie. The new A. Lange & Söhne Datograph Perpetual Tourbillon is a masterpiece of horology that took the center stage at the Lange booth this year and one of the most impressive watches of all brands exhibiting at the salon. This feat of horology from the masters from Saxony, pairs three complications with five supplementary functions in just one timepiece. This unique timepiece by A. Lange & Söhne is not only technically impressive, but also stands out with a superbly well organized dial layout despite the number of indicators that appear on it. During the development of a multiple-complication timepiece, the most formidable challenge is to achieve the perfect interaction between different highly complex mechanisms and embedding them in a smoothly functioning ensemble. The A. Lange & Söhne Datograph Perpetual Tourbillon accomplishes that and more, in a piece of horology that can be considered a work of art. Fitted with a platinum case with a diameter of 41.5 mm, a thickness of 14.6 mm and a total weight of 156.9 grams, the watch is not only extremely beautiful but extremely well crafted as Lange perfectly knows how to do it. Equipped with a black solid-silver dial, the new A. Lange & Söhne Datograph Perpetual Tourbillon keeps its gorgeous looking tourbillon well hidden on the back and perfectly reserved for whom is wearing the watch. No need to impress others or to perturb the dial layout with it. The Datograph model is not only one of the most iconic models of A. Lange & Söhne, but one that designates a column-wheel chronograph with a precisely jumping minute counter, a flyback function and the typical Lange over sized date. This time, by adding one of the most noble of all horological complications —the perpetual calendar— to it, Lange takes this piece to the next level. But this is not your run-of-the-mill perpetual calendar, this is an instantaneously jumping perpetual calendar with a moon phase display. All indications of the perpetual calendar including the oversized date as well as the day-of-week —with buit-in day/night indicator—, month and leap-year displays in subsidiary dials switch instantaneously at midnight, with a snap that takes a fraction of a second. The moon phase disc made of solid white gold features an exact representation of the celestial chart with the stars as seen from Glashütte in Germany. A first correction of the mechanism by one day can wait until the first day of March in the secular year 2100. And because of its stunning mechanical precision, the moon phase display will only deviate from the true lunation by a single day after 122.6 years. Three correctors allow the separate adjustment of the moon-phase display, the day of the week and the combined advance of the month and leap-year indications. After a standstill of merely a few days, the rapid-correction pusher at ten o’clock can be used to conveniently update all displays at the same time. A linear white/red power reserve indicator completes the layout between 9 and 11 o'clock. The power reserve indicator at the end of the tachymetric scale, reminds the owner when it is time to rewind the watch. As mentioned before, the fascinating tourbillon mechanism is exposed by the sapphire-crystal case back and the open tourbillon bridge. The beating heart inside the new SIHH 2016 A. Lange & Söhne Datograph Perpetual Tourbillon is the new in-house manual wound calibre Lange L952.2. This movement is composed of 729 parts and 59 jewels, one being a diamond endstone. The movement provides a power reserve of 50 hours when fully wound and for the first time in a Lange tourbillon with chronograph, the balance beats at a rate of 18,000 vph instead of the conventional 21,600 vph. Consequently, stopped times can be displayed with an accuracy of one-fifth of a second. The patented stop-seconds mechanism instantaneously brings the balance wheel inside the tourbillon cage to a standstill when the crown is pulled. This allows the watch to be set with one-second accuracy. On the wrist, the watch wears slightly smaller than its actual size due to its black dial but still quite close to its actual size. The watch is supplied with a hand-sewn black alligator strap with matching Lange platinum deployant buckle. The new SIHH 2016 A. Lange & Söhne Datograph Perpetual Tourbillon is only available in a limited edition of a 100 pieces in platinum. Sticker Price 295,000 Euros. 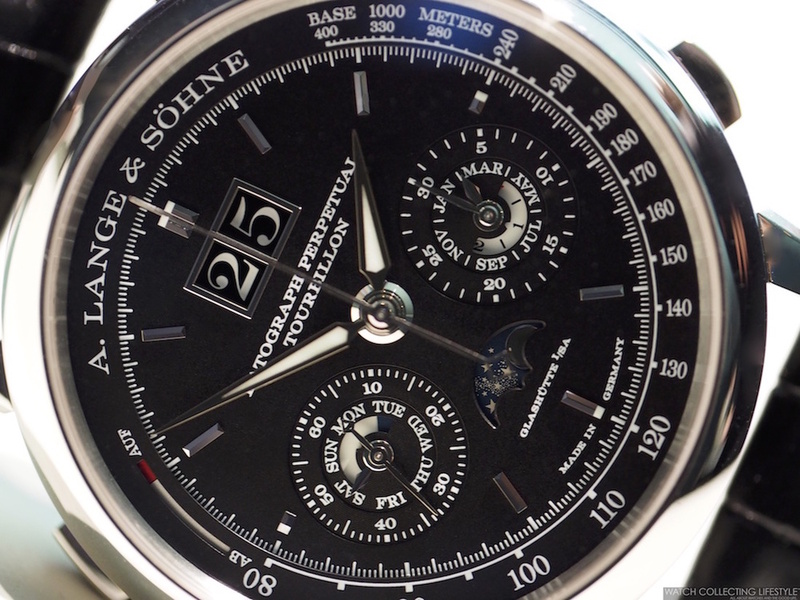 For more info on A. Lange & Söhne click here. Posted on January 25, 2016 by Editor & Publisher and filed under A Lange Sohne, SIHH 2016, SIHH and tagged A. Lange & Söhne Datograph Perpetual Tourbillon SIHH SIHH 2016 Most Popular.